The 21-year-old star joked he was busy watching his older sibling Gemma's new man as One Direction took to the stage at the The Roundhouse in London last night (22.09.15). He said: "Sorry if I seem a little distracted. My sister is on a date. They're up there somewhere ... behave yourself. Meanwhile, the group also joked they were "dropping like flies" when Niall Horan disappeared from the stage. His disappearance prompted the other three members - Harry, Liam Payne and Louis Tomlinson - to jest about losing a second band member following Zayn Malik's departure earlier this year. When they noticed he'd disappeared, Harry said: "We've lost another one! We're dropping like flies!" Whilst Louis added: "We're like Take That." 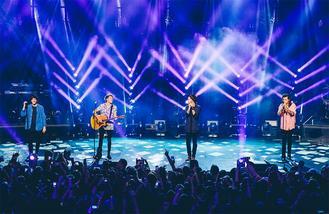 Niall made his return and the 'Night Changes' hitmakers carried on with their electric set, exciting the crowd with fan favourites including 'What Makes You Beautiful' and 'Little Things' as well as their newer offerings, 'Drag Me Down' and 'Where Do Broken Hearts Go'. And it wasn't just their young fans who enjoyed the show - Selena Gomez, Suki Waterhouse, Bella Hadid and Stella McCartney were also in attendance. Niall later apologised for his disappearing act, admitting the heat was making him feel ill.
"But thank you so much for having us - we've had a cracking time." The chart-topping boy band rounded off their set with a rendition of 'Best Song Ever,' giving the 2000-strong audience a great end to a memorable evening.